Cutaneous leishmaniasis: Involving the skin at the site of a sandfly bite. Cutaneous forms of the disease normally produce skin ulcers on the exposed parts of the body such as the face, arms and legs. The disease can produce a large number of lesions-sometimes upto 200 causing serious disability. Visceral Leishmaniasis: Involving liver, spleen and bone marrow. 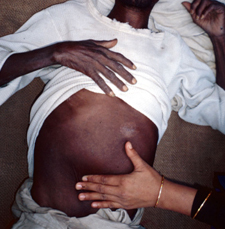 It is also known as Kala azar and is characterised by irregular bouts of fever, substantial weight loss, Hepatomegaly and Splenomegaly and anaemia. If left untreated, the fatality rate in developing countries can be as high as 100% within 2 years. Mucocutaneous Leishmaniasis: Involving mucous membrane of the mouth and nose after spread from a nearby cutaneous lesion.Lesions can lead to partial or total destruction of the mucous membranes of the nose, mouth and throat cavities and surrounding tissues. in a patient in lowland Nepal. Typical New World cutaneous leishmaniasis ulcer. Photo: B. Arana, MERTU, Guatemala. Different species of leishmania cause different disease. Leishmania donovani causes Viceral leishmaniasis also called Kala-azar. The infection is generalized and the parasite is distributed in the internal organs. The parasite may also cause a variety of skin lesions (dermal leishmaniasis) without any visceral manifestations. L. tropica, causes oriental sore. The infection is limited to a local lesion of the skin and subcutaneous tissues. Leishmaniasis is endemic in more than 60 countries worldwide, including southern Europe, North Africa, the Middle East, Central and South America, and the Indian subcontinent. It is not endemic in SouthEast Asia and Australia. There are estimated 500,000 new cases of VL and more than 50,000 deaths from the disease each year. The burden of cutaneous leishmaniasis disease (90% of cases) is borne by Afghanistan, Pakistan, Syria, Saudi Arabia, Algeria, Iran, Brazil and Peru and for Visceral leishmaniasis by India, Bangladesh, Nepal, Sudan and Brazil. Only India, Nepal and Bangladesh harbours an estimated 67% of the global VL disease burden. VL in Nepal is mainly confined to the southern plain of the eastern and central regions, bordering VL endemic districts of Bihar state in India. Siraha, Dhanusa and Mohattari district are considered endemic with the disease. Occasional sporadic cases occur elsewhere. Around 5.5 million people live in affected areas, so are classified “at risk”. A total of 25704 cases with 530 deaths were reported between 1980 and 2004 (440 cases per 100,000 in 20 years), and the case fatality rate in reported cases varied between 0.23 (in 1988) to 13.6 (in 1982). The current strategies for Visceral Leishmaniasis rely on reservoir and vector control, the use of insecticide impregnated materials and active case detection and treatment, anti-leishmanial vaccines are still being developed. Since man is the only reservoir of kala azar in Nepal, active and passive case detection and treatment of those found to be infected (including PKDL) may be sufficient to abolish the human reservoir and control the disease. The application of residual insecticides has proved effective in the control of sandflies. DDT is the first choice since the vector of kala azar P. argentipes is susceptible to DDT. Insecticide spraying should be undertaken in human dwellings, animal shelters and all other resting places up to a height of 6 feet from floor level. Spraying should be preceded and followed by an assessment of susceptibility. Any sign of resistance in vector should lead to an immediate change in insecticide. BHC should be kept as a second line of defence. The use of insecticide-treated bednets (ITNs) could concomitantly prevent Visceral Leishmaniasis and other vector borne diseases, such as malaria and japanese encephalitis. Depending on the sleeping traditions of the population and biting habit of the local vector, other insecticide-impregnated materials such as curtains and blankets should be evaluated for use in Visceral Leishmaniasis prevention. Early diagnosis and treatment are essential for both individual patients and for the community. Untreated VL patients act as a reservoir for parasites and therefore contribute to disease transmission in anthroponoticVL areas. Early case finding and treatment is therefore considered an essential component of VL control. The risk of infection can be reduced through health education and by the use of individual protective measures such as avoiding sleeping on floor, using fine-mesh nets around the bed. Insect repellents for temporary protection and keeping environment clean.